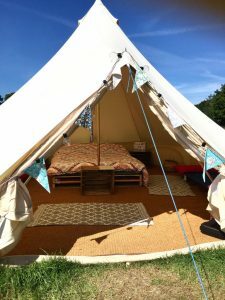 Meet our two beautiful bell tents, Lovelily Bell and Ruby Bell – allowing you to take your camping experience to another level and enter the world of glamping. 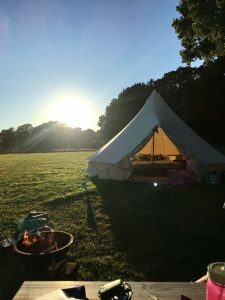 Perfect for a couples country getaway and even roomy enough for a family of five to escape to the country, the two five metre bell tents come fully furnished, meaning all you need to bring is yourself (and maybe a good book) – leave the rest up to us. 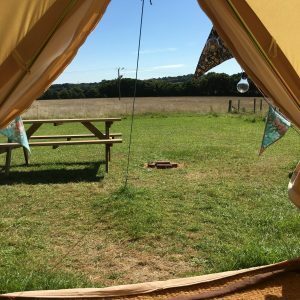 – Kitchen box with cooking essentials including enamel dining plates, bowls and mugs, cutlery, kettle, frying pan, cooking pots, tea/coffee pot, spatula, wooden spoons, masher, sieve, can opener, tea towels, salt, pepper, sugar and oil – not forgetting a bottle opener! 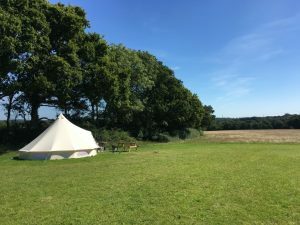 – Friday, Saturday and Sunday: £90 per night. 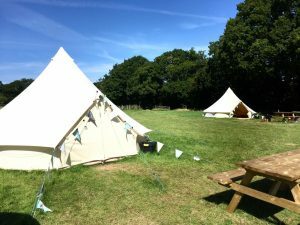 – Monday, Tuesday, Wednesday and Thursday: £70 per night. 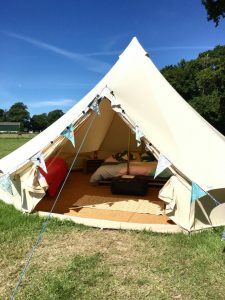 Plus, you can now hire two of our bell tents unfurnished – perfect for those who want a blank canvas to create their own space and bring their own beds and bedding. Includes full coir circle matting.